Most people establish a stable attachment to the workforce during their late teens and early twenties that sets them on the path for their career. They finish their studies, obtain employment and begin to live independently. Unfortunately, some youth do not make the transition from student to employee. 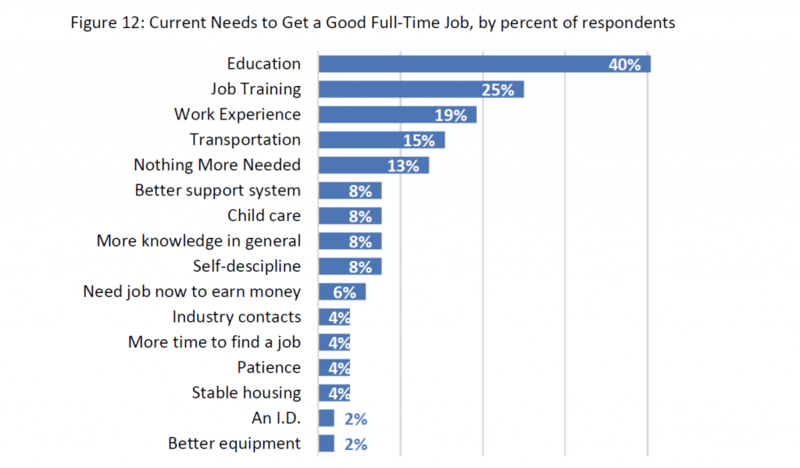 These young adults are disconnected from both educational systems and the labor force. They are missing opportunities to build their human capital and gain job experience and skills at a critical point in their lives. As a result, they are at risk for poorer economic health and social outcomes over their lives. 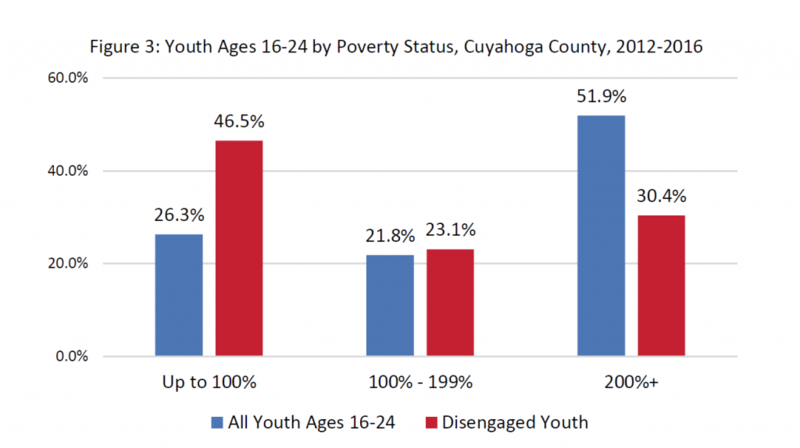 Despite the end of the Great Recession in 2009, the number of disengaged youth in Cuyahoga County has held steady. When youth are disconnected from education and employment, the economy misses out on their earnings and potential tax revenue and costs in other areas increase. One study found that over a lifetime, each disengaged youth creates a “fiscal and social burden” of more than $1 million. Every year that the young person remains disengaged results in $44,158  in missed wages, lost tax revenue, increased need for public assistance and social services and other societal costs. Connecting young people to the workforce and future careers improves individuals’ prospects and is critical for a healthy economy and a well-functioning society. There are many names for the group of people ages 16 to 24 who are neither in secondary or post-secondary school, nor employed full- or part-time. They have been called “Disengaged Youth,” “Opportunity Youth,” “Disconnected Youth” and even “Idle Youth.”  Regardless of the title used, they are a target population for workforce development agencies and engaging them can be a key solution to the regional skills gap challenge. An estimated 21,000 youth in Cuyahoga County were in the disengaged youth category in 2012-2016. 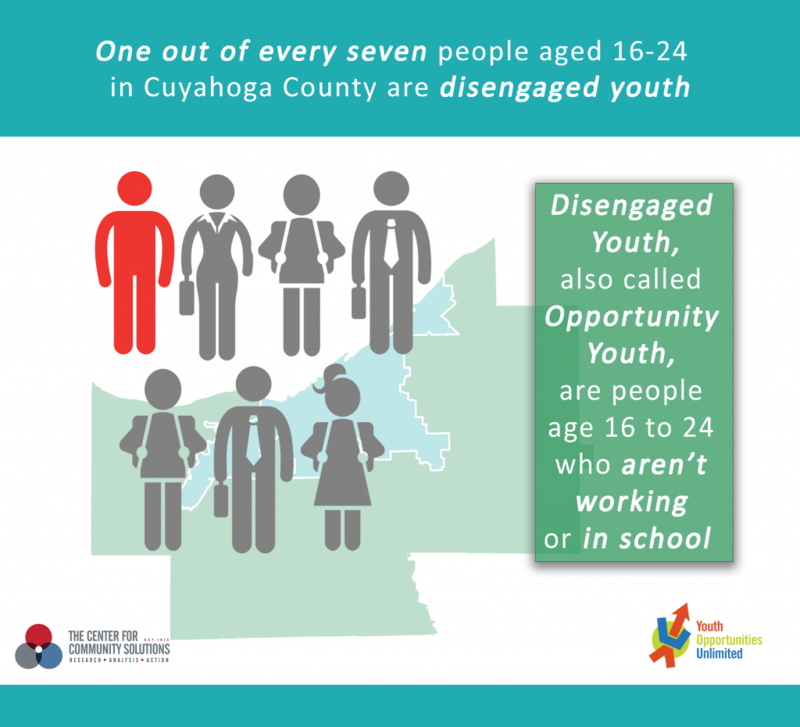 Despite the end of the Great Recession in 2009, the number of disengaged youth in Cuyahoga County has held steady. One out of every seven Cuyahoga County residents between the ages of 16 and 24 are neither in school nor employed. 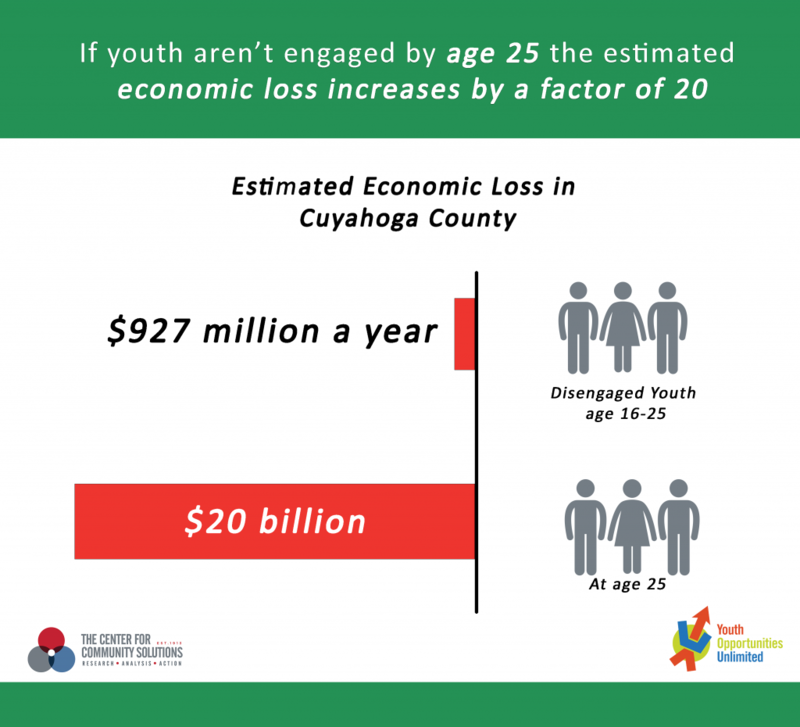 As described in further detail below, using figures from the Corporation for National Community Service and the White House Council for Community Solutions, we estimate that disengaged youth in Cuyahoga County cost our economy more than $900 million per year. Investments to help youth become and remain engaged with school and career can pay dividends. To gain an understanding of the aspirations and challenges facing disengaged youth in Cuyahoga County, Youth Opportunities Unlimited engaged Falls Communications to conduct one-on-one interviews. The Center for Community Solutions analyzed interview results. These interviews show that disengaged youth have both short- and long-term aspirations, but their plans for reaching their goals were problematic. Barriers to reaching educational and career goals included family issues, cost, and self-discipline. Most recognized they need education, job training or work experience to get a “good job” but often did not know where to turn. Information gained from these interviews provides a path to connect young adults to education and/or employment. Disengaged youth come from a variety of backgrounds and circumstances. The group includes those who have graduated from high school, as well as those who dropped out before completion. Some remain at home with their parents or other family members so have the benefit of continued support. It captures individuals who remain at home, caring for family members; those who may have completed their studies but are unable to find work and even some taking a “gap year” after graduation. While data shows that some disengaged youth are from higher-income families in the suburbs, many disengaged youth grew up in impoverished neighborhoods, attended low-performing schools, faced challenging family circumstances and may have few positive experiences with education and social service systems. 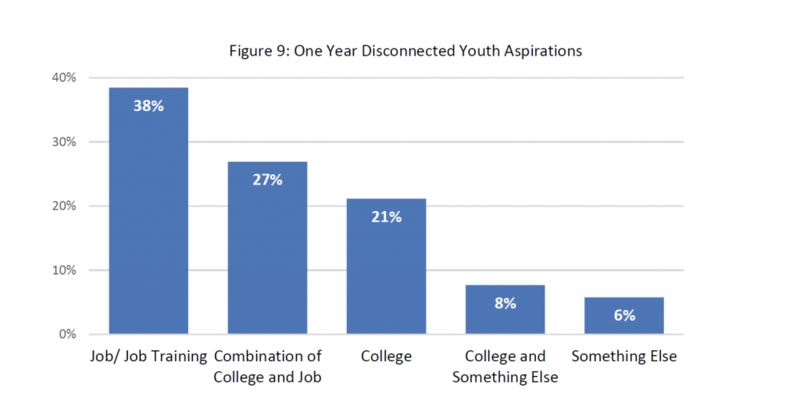 Regardless of personal circumstances, disengaged youth lack a stable connection to either education or the workforce. An estimated 21,000 youth in Cuyahoga County were in the disengaged youth category in 2012-2016. They comprise 14.1 percent of all youth in the county ages 16 to 24. Disengaged youth were more likely to be male, African American and live in poverty, as shown in Figures 1 and 2. 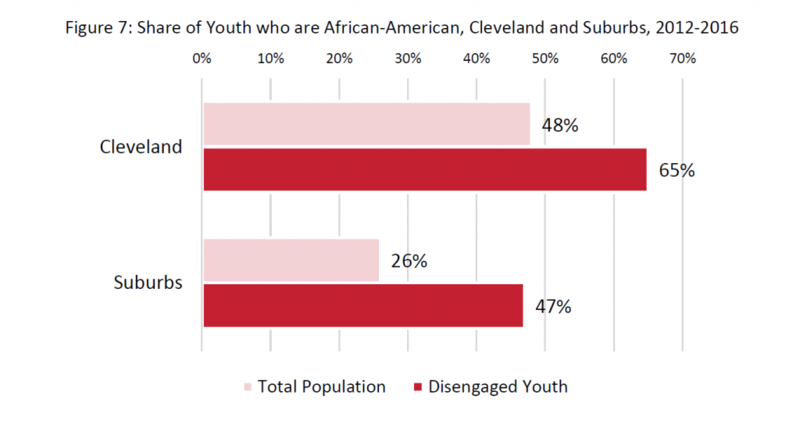 One-fifth (21.3 percent) of youth in the city of Cleveland were disengaged youth, more than twice the proportion of suburban youth (9.9 percent). While the overall percent of disengaged youth has not changed, raw estimates using U.S. Census Bureau data shows a slight decline in the share of disengaged youth in Cleveland since the 2007-2011 period, but an increase in the share of disengaged youth in the suburbs. However, none of the changes are statistically significant. From available data, it is unclear if the decline is the result of people “aging out” or from youth becoming better connected to the economy. 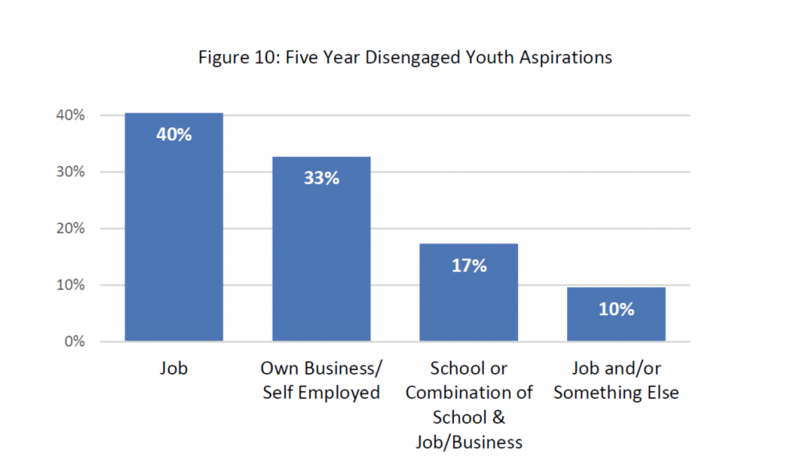 NOTE: Disengaged Youth are defined as ages 16-24, not in school, and either unemployed or not in the labor force. Changes in disengaged youth as a percent of 16-24 year-olds are not statically significant and should be interpreted with caution. 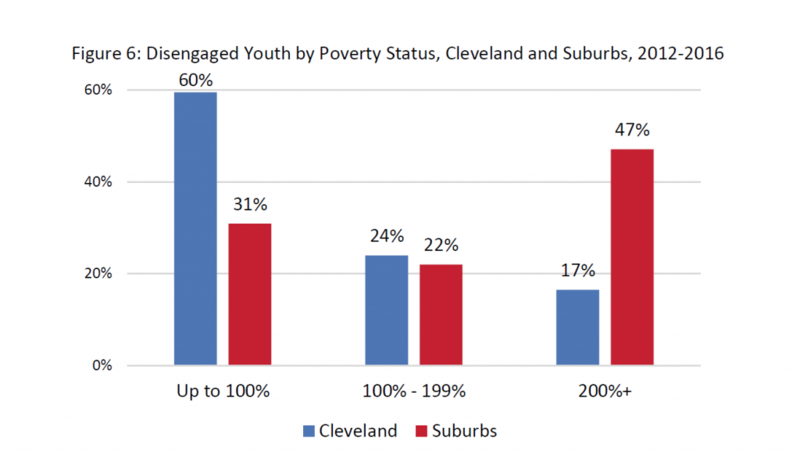 There are notable differences in the composition of the disengaged youth population between Cleveland and the suburbs. Disengaged youth in Cleveland are evenly split between male and female, while disengaged youth in the suburbs were more likely to be male. African-American youth predominate in Cleveland (64.6 percent), compared to the suburbs. Three-fifths of disengaged youth in Cleveland live below 100 percent of the poverty level (59.5 percent), while almost half of suburban disengaged youth (47.1 percent) have household incomes 200 percent or more above the poverty level. These disparities are shown in Figures 4, 5, and 6. As shown in Figure 7, African-Americans make up a disproportionate share of disengaged youth. This racial disparity is pronounced in both Cleveland and the suburbs. Young people of color are less likely to be engaged in the workforce or careers than their white peers. This disparity could perpetuate generational poverty, lower educational attainment and presents challenges for wealth creation. A previous study by Policy Matters Ohio found lower levels of employment and earnings among young people of color in Cleveland. 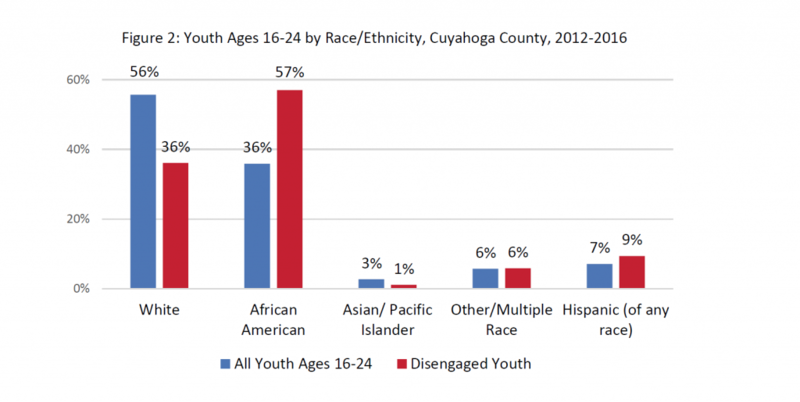 Cuyahoga County’s share of disengaged youth is larger than surrounding counties. Figure 8, below, shows the percentage of disengaged youth in Northeast Ohio counties, compared to Hamilton (Cincinnati) and Montgomery (Dayton) in Ohio, and three out-of-state counties: Baltimore, Maryland; Wayne, Michigan (Detroit) and Allegheny, Pennsylvania (Pittsburgh). 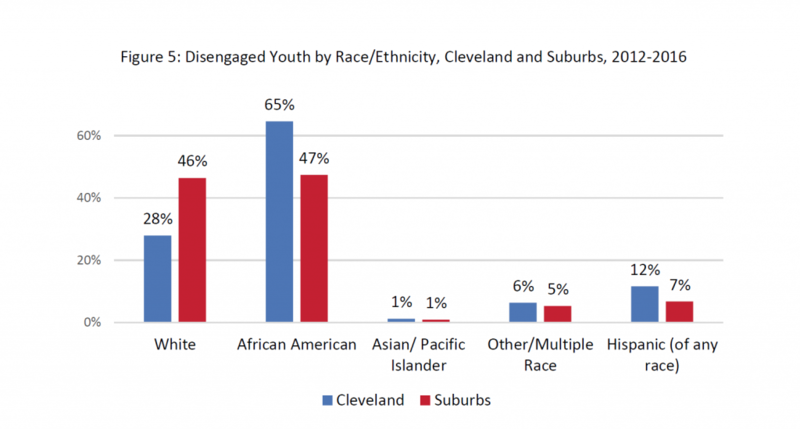 Of these comparison counties, Wayne is the only one with a higher proportion of disengaged youth than Cuyahoga. The trends in Cleveland and Cuyahoga County mirror national trends, which show that youth in the suburbs are the least likely to be disconnected, but that disengagement is a problem disproportionately impacting young men and people of color. When youth do not connect with career pathways, they lose earnings both today and in the future. Unemployed and under-employed adults are more likely to experience health problems and to encounter the criminal justice system. The Corporation for National and Community Service and the White House Council on Community Solutions estimated that each disconnected youth cost taxpayers $13,900 per year and society $37,450 per year in 2011. Update for inflation, the cost is $44,158 in 2018 dollars. These burdens overlap slightly. Foregone wages and the associated tax collections, increased costs due to poor health and increased crime and the need for spending on public benefits means that the total “lifetime lump sum burden” after age 25 of each disconnected youth topped $683,000. These figures are based on estimates produced by the National Corporation for Community Services and the White House Council for Community Solutions , and have been updated for inflation. Full information about assumptions and methodology is available in their report, but is briefly summarized here. Gross earnings and taxes are calculated using the difference between disengaged youth and those who are working full- or part-time, based on data from the Current Population Survey of the U.S. Census. the 21,000 disengaged youth in Cuyahoga County have an estimated negative economic impact of $927 million per year. Crime includes direct costs resulting from criminal justice, policing and corrections expenditures, plus the indirect impact that crime has on victims, including lost earnings and monetary damages. This estimate is based research which indicates that disengaged youth are more likely to be engaged in criminal activity. Similarly, disengaged youth are less likely to report good health status and more likely to have been treated for behavioral health issues including mental illness and substance use disorders. Disengaged youth are also more likely to rely on Medicaid for health coverage. Benefits and services is a conservative estimate which only includes direct transfer benefits such as cash assistance (TANF), WIC, and Supplemental Nutrition Assistance Program (SNAP), plus a limited number of social support grant programs. Finally, disengaged youth are, by definition, not in school, so there are short-term cost savings relating to education expenses. It is estimated that half of disengaged youth in the U.S. are “chronically” disengaged,  and have almost no work experience or formal education. These individuals require substantial support to connect to a career pathway. Nearly one-quarter of young adults ages 18-24 in Cleveland lack a high school credential, more than twice the share in the suburbs. On the other hand, 60 percent of suburban young adults have at least some college, and 16 percent have obtained at least a bachelor’s degree by the time they turn 25, compared to only 10 percent in Cleveland. Youth who are not currently in school but have participated in higher education are far from full participants in the economy, but they have more human capital and are likely to have accumulated some work experience. This means they could play a much more productive role, given appropriate supports. Youth who had at least a high school diploma or credential, but who were unemployed or working part time were the focus of deeper research. Structured interviews with 52 disengaged and underemployed youth from the Greater Cleveland area provide insight into the aspirations of disconnected youth and the challenges they face. All of the individuals interviewed identified themselves as African-American and two-thirds were male. They were relatively evenly spread between the ages of 18 and 24. Given the demographic makeup of the interviewees, the information they shared may be particular useful when attempting to reduce racial and gender disparities among disengaged youth. Youth were asked about their one- and five-year aspirations, the steps they expected to take to reach those goals and what they feel they still need before they can get a good job. Nearly one-quarter of young adults ages 18-24 in Cleveland lack a high school credential, more than twice the share in the suburbs. The interviews showed that young people often think and dream about their future prospects. 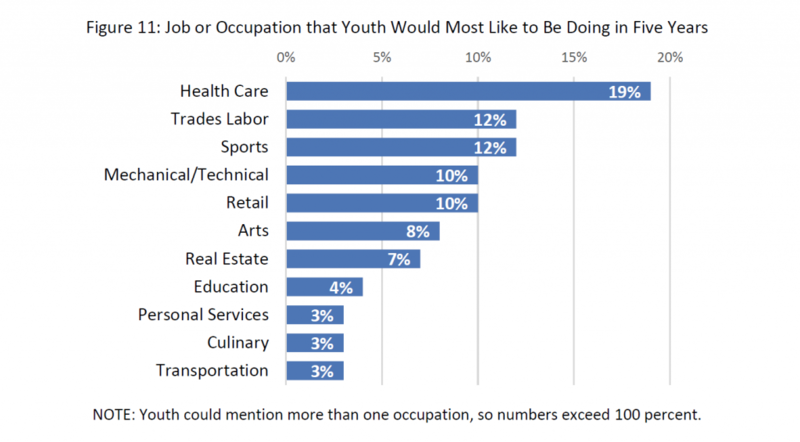 Nearly all of the disengaged youth hope to have a job and/or be in college one year from now. The rest were undecided, primarily torn between a job and/or college and something else, like joining the military or playing semi-professional sports. Of those considering college in the next year, most (59 percent) hoped to enroll at Cuyahoga Community College, especially in occupational programs in the healthcare and skilled labor fields. Working in health care or trades such as welding, auto mechanic, and construction were also aspirations for youth hoping to have a job within a year. The number one aspiration for their personal lives was to live independently in their own place. Being financially stable was a close second. This was also the most common longer-term goal, and within five years, many disconnected youth hoped to be married with children. While these disengaged youth have clear aspirations, many guess or make assumptions about the best path to get there. All but two of those interviewed had a specific occupation in mind and some plan to achieve it. Nearly one-third (31 percent) had a full and realistic plan. However, a full quarter had either no plan or an unrealistic one. An additional 44 percent had plans with issues that could be addressed, such as the assumption of college and of starting a business without addressing the funding required or a leap from one step to another without a needed step in between. One example was, going directly from a degree from Tri-C to being a sports broadcaster. The disengaged youth were willing to work hard toward their goals, but their plans to reach them were problematic. Missing steps were often not about poor planning; they were about not knowing the actual career path for their chosen occupation. All youth could identify career aspirations. Youth were asked to identify the barriers they faced in achieving their plans. When asked “What could prevent you from reaching your goals?,” 60 percent of responses were related to emotional fears, worries, or barriers, such as self-discipline, fear of failure and uncertainty about the future. The remaining 40 percent of barriers included the need for money, family issues and personal problems. For those that rated the likelihood of doing what they hoped to be doing as 7 out of 10 or less, some reasons given were: family problems, including the possibility of having to care for an aging relative, the difficulty of finding full-time work and the steps required will likely take longer than a year. While these disengaged youth have clear aspirations, many guess or make assumptions about the best path to get there. Most of the youth recognized that they needed additional education, job training and prior work experience to get a good full-time job. Several identified personal barriers they would need to overcome, including transportation, child care and stable housing. The 52 interviewees identified 92 possible sources of information about organizations in Cleveland that help young people reach their education or career goals. Most commonly mentioned were online sources, including Google, Facebook, and Instagram. However, interviewers reported that when questioned about the actual search terms they would use, it was apparent that very few of the youth knew how to conduct fruitful research online. Youth that would not search online said they would ask someone they know, primarily family and friends, rather than seeking information from institutions or government agencies. As the interviews showed, disengaged youth want to be financially stable and live independently, recognize and are willing to work hard toward their goals and formulate plans to reach them. However, they have difficulty making plans, some of their aspirations are unrealistic, and many face barriers which must be overcome before they can take advantage of opportunities to realize their full potential. Although not intended to represent a statistically significant sample of all disengaged youth in Cleveland, the information gathered through these interviews provides useful insights into some of the challenges facing disconnected youth. It is no accident that programs targeting the disengaged population are often called “opportunity youth” services. Connecting disengaged youth to school and job is vital for a prosperous economy. The group of young people who are not currently in school and not working present significant opportunity to improve our economy and reduce societal burden. Data on the fiscal and societal burden resulting from disengaged youth implies that well-designed programs which connect youth to education and careers costing less than $25,000 per year per participant would have an immediate positive return on investment in the short-term, which grows over the individual’s working life. Such investments today could pay dividends well into the future. A focus on connecting disengaged youth to school and career can break generational cycles of poverty, especially since some are already parents themselves. But there are few quick fixes. Several local partners, including Youth Opportunities Unlimited, Towards Employment, Ohio Means Jobs Cleveland/Cuyahoga County and Cuyahoga County Health & Human Services, have come together as part of an initiative focused on Youth and Young Adults called Generation Work. 1) Align workforce systems and leadership: By establishing a community framework for delivering services, communicating best practices and emerging opportunities, and reviewing and advising on relevant local policies, the partners seek to align efforts to increase effectiveness. This includes outlining shared goals and communicating with stakeholders. 2) Improve Quality of Programs & Increase Participation: The partners are sharing best practices in workforce development for youth and young adults across a wide range of providers and offering technical assistance to improve integration of positive youth development and demand driven strategies. They will pilot new ideas and share results in an effort drive increased engagement of youth/young adults. 3) Organize Young Adult Outcome Data Shared & Disaggregate it by Race: As shown by the data presented above, there are racial disparities among disengaged youth. Generation Work will identify and build upon shared indicators across partners and facilitate gathering of outcomes data disaggregated by race. This will allow the partners to establish targets for reducing disparities in outcomes by race, generate stakeholder engagement and support for approach, offer technical assistance, and monitor progress. 4) Deepen and Increase Meaningful Employer Engagement: The Generation Work partners seek to engage employers more deeply in supporting a variety of strategies for youth and young adult employment and to consider their own hiring policies and practices in the process. One outcome of these efforts will be that employers are clear on what is available through the workforce system and how to engage. 5) Increase Funding and Improve the Funding Environment: Better alignment, leveraged funding, and additional investments will ensure more resources are available to serve youth and young adults across Cuyahoga County. Identifying personal aspirations, creating clear and realistic plans and helping overcome challenges along the way are all needed to help disengaged youth realize their potential. Collaboration, such as that begun under Generation Work, is one avenue to make change. Belfield, Clive R., Henry M. Levin, and Rachel Rosen, “The Economic Value of Opportunity Youth,” Corporation for National and Community Service and the White House Council for Community Solutions, 2012. The economic value of opportunity youth was presented in 2011 dollars. It has been updated for inflation. “Opportunity Youth” is the label current favored by the federal government, and the term “idle youth” was long-used by the U.S. Census Bureau. We believe “disengaged youth” is the most accurate description, so use it throughout this report. All estimates come from the Census Bureau’s American Community Survey (ACS) Public Use Microdata Sample (PUMS), as made available by IPUMS-USA, University of Minnesota, www.ipums.org. Sheilds, Michael. “Cleveland youth face barriers to good jobs.” Policy Matters Ohio, August 2017. Basu, Rupsha, et al, “More than a Million Reasons for Home: Youth Disconnection in American Today.” Measure of America of the Social Science Research Council, March, 2018. This figure assumes that the youth are disengaged from education and employment for most of the time between ages 16 and 24. 11 Y.O.U. outreach specialists chose the interview locations and recruited the interviewees. Locations included several Cleveland-area fast food restaurants, public libraries, recreation and community centers, and nonprofit direct service providers. Researchers from Falls Communications conducted the one-on-one interviews in mid-2017, each taking around 30 minutes. Interviewees were provided $25 gift cards for participating.